My good friends, Mr. and Mrs. Smith, were just married earlier this year. Another milestone presented itself in the form of Mr. Smith’s 40th birthday just a few days ago. To celebrate, Mrs. Smith threw him a surprise party over the long weekend. I had always planned on bringing a dessert to this shindig but when I heard she didn’t have a birthday cake, I gladly offered to make one. This was purely for selfish reasons – I want to practice making layer cakes plus I have crazy ideas that are too delicious to remain as fantasy in my head. 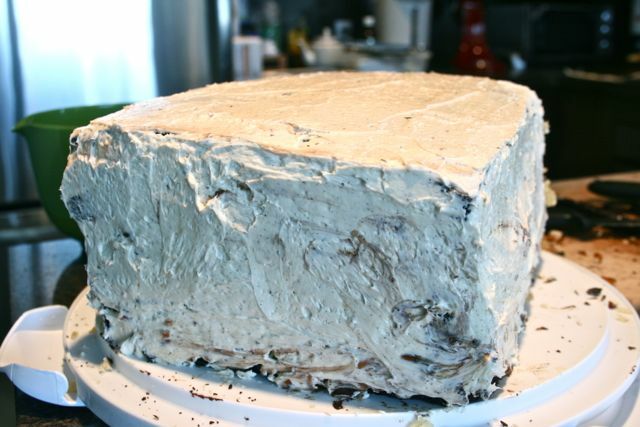 40 is a pretty big milestone so I wanted to make a huge over-the-top cake to commemorate this special occasion. I started baking late on Saturday night and doubled my favourite chocolate cake recipe, which I made for my own birthday (see here). I had two bowls going at once. I don’t mess around, yo. 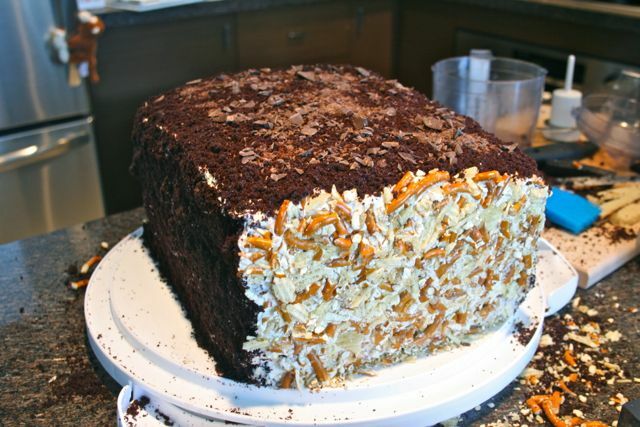 The next morning, I woke up early and decided I didn’t have enough cake. For a contrast in colour, I decided to make a vanilla cake and used Joy the Baker’s vanilla bean cupcake recipe. I then made Dorie Greenspan’s bittersweet ganache. To be honest, I have no idea how much chocolate I used. 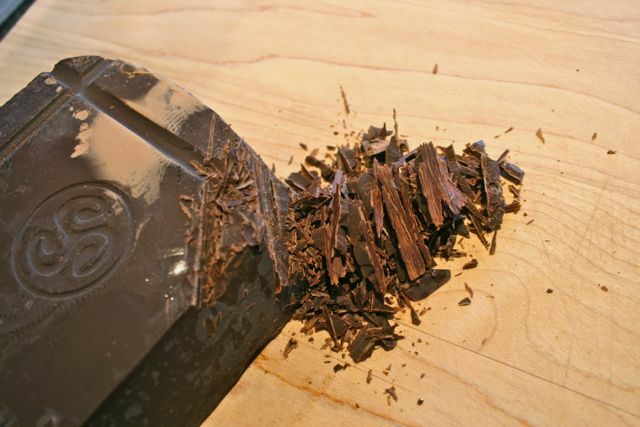 I hacked apart a giant hunk of Callebaut dark chocolate and used most of it. I’d been saving this chunk for a special occasions. It started to bloom but since it was going to be melted, it didn’t matter how it looked. 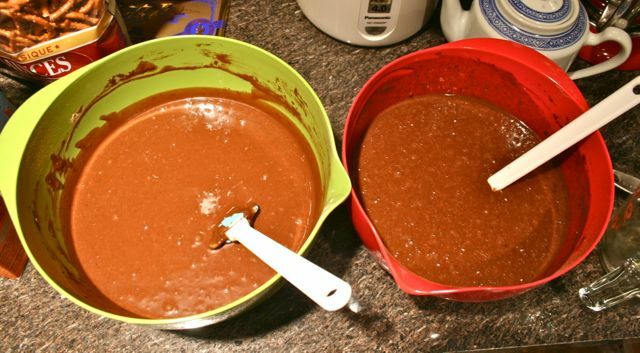 To make the ganache, I boiled 1 1/4 cup whipping cream, poured half of it into the chocolate and stirred. I then added the other half of the hot cream, stirred until smooth, and added about 4 tablespoons of unsalted room temperature butter. 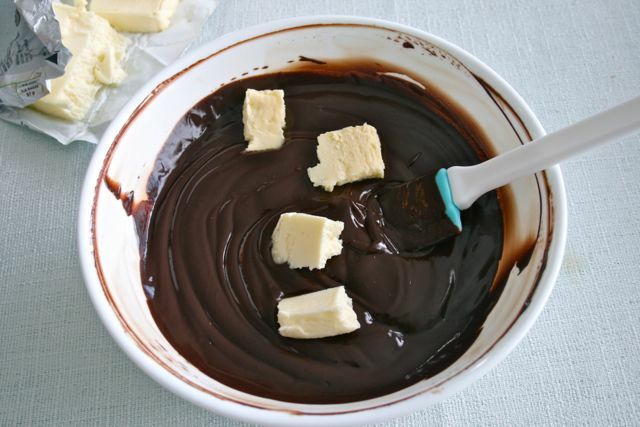 It’s simply that easy to make perfect, silky, decadent ganache. I left it at room temperature for several hours until it firmed up and was the right consistency for spreading, like a really thick frosting. 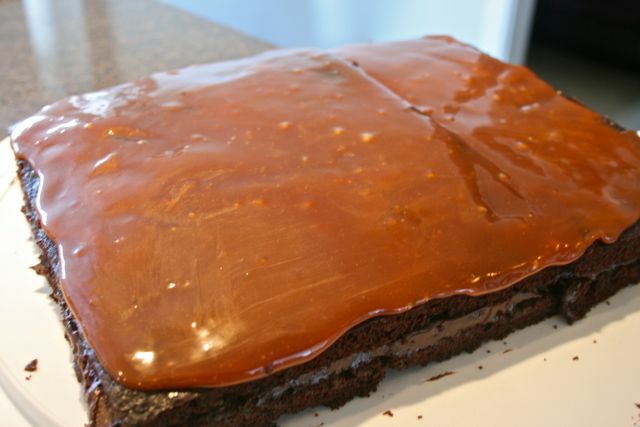 I then made caramel for the first time in my life, also using Dorie’s recipe for the caramel that tops her caramel-peanut-topped brownie cake. By this time, I was feeling pretty cocky in the kitchen and didn’t read her recipe carefully enough. 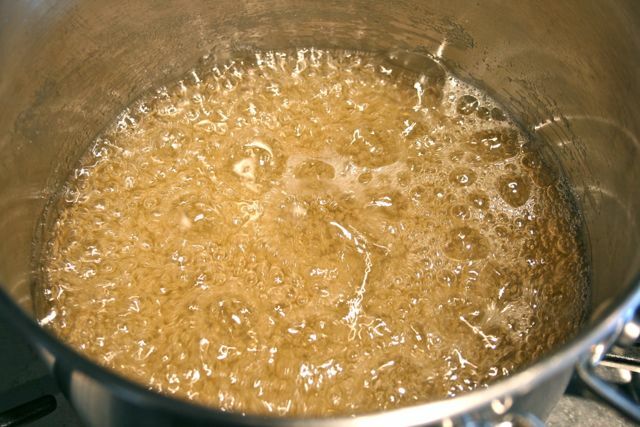 You’re supposed to put sugar, water and corn syrup in a saucepan and stir to combine. I stupidly put in sugar, water, corn syrup and the whipping cream. Thankfully, I soon realized my mistake, dumped that down the drain and started over again. 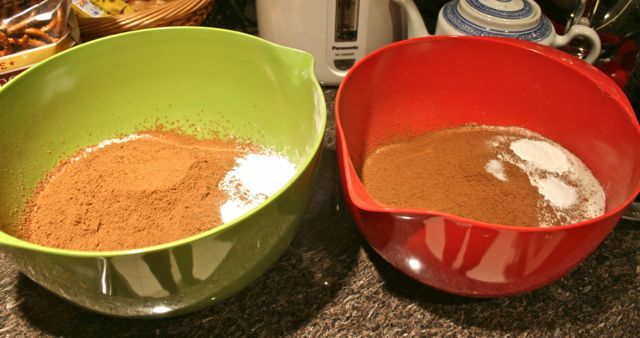 It pained me to waste 2 cups of sugar – what an idiot! 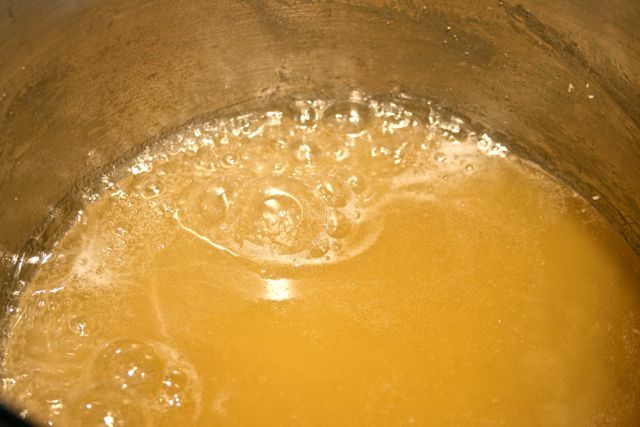 Put the sugar, water and corn syrup in a medium heavy-bottomed saucepan. Stir to combine. Turn the heat up to medium-high. 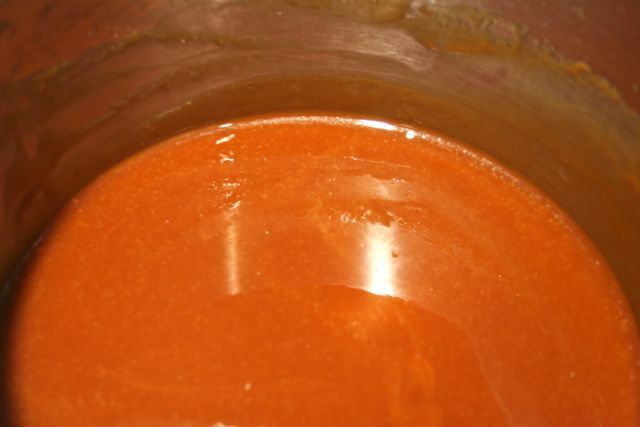 Heat, without stirring, until the caramel turns deep amber. This will take about 5-10 minutes. 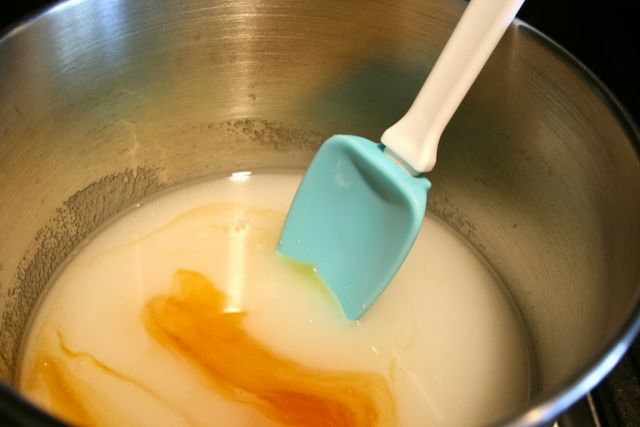 As the sugar is caramelizing, use a wet pastry brush to wipe down any splatters on the sides of the pan. You want a really deep colour – if it’s too pale, it won’t be very flavourful. 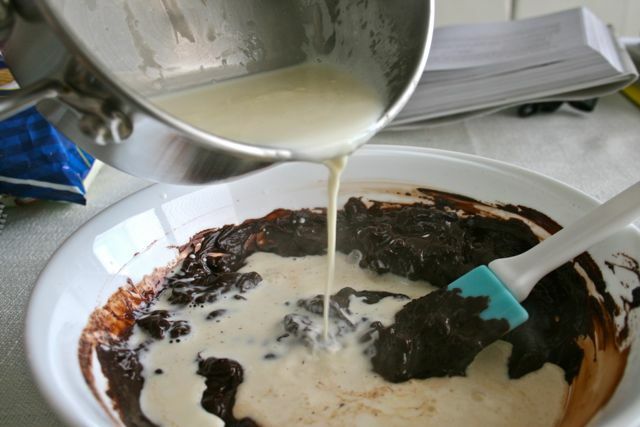 As soon as it’s a dark, deep, golden amber colour, turn the heat down and slowly add the cream and butter. Stand back cause the caramel is going to sputter like crazy. 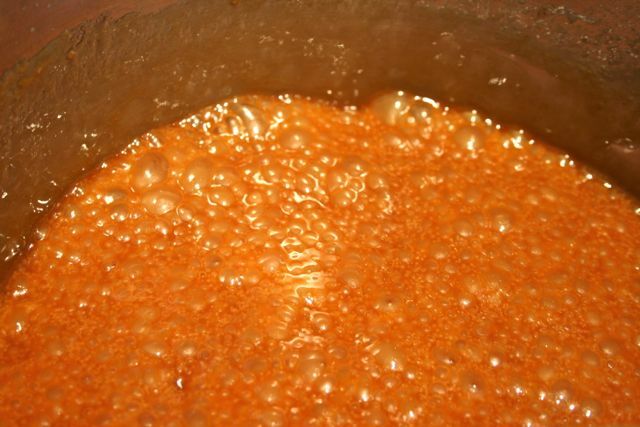 Stir to calm the caramel and make sure all lumps are dissolved. Take it off the heat and cool it. If it gets too hard to work with, gently reheat it. The caramel was surprisingly easy to make. The one thing I’d warn you about is that it goes very quickly from pale to dark. You have to watch it very carefully or else it’s going to burn. Check out this glorious, dark golden caramel. It tasted amazing. Now came the fun part – assembly. Thank God the Husband wasn’t home while I was putting it together. My kitchen was a complete mess – there were crumbs, utensils and frosting everywhere. Being the super woman that I am, I completed my masterpiece AND finished cleaning the kitchen just as the Husband walked through the door. 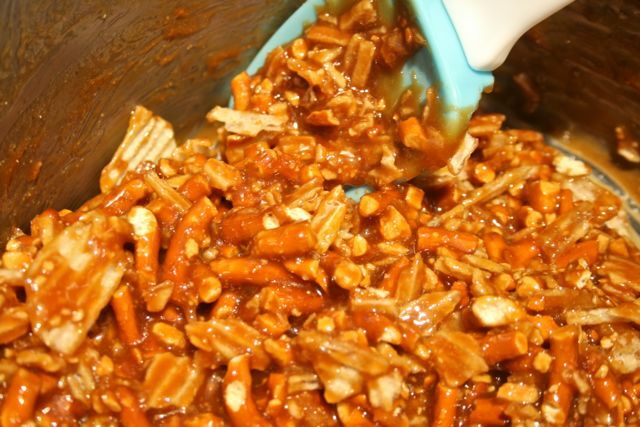 My master plan for the caramel was to mix it with crushed pretzels and potato chips for that salty sweet crunchy chewy combo. I figured it was a good way to man-up the cake. Something good is about to go down. 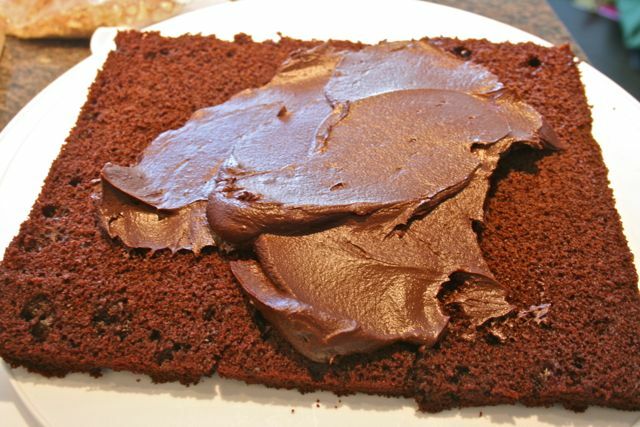 Spreading the ganache on the bottom layer of cake. The next layer gets the caramel treatment. Look at how gorgeously glossy it is. 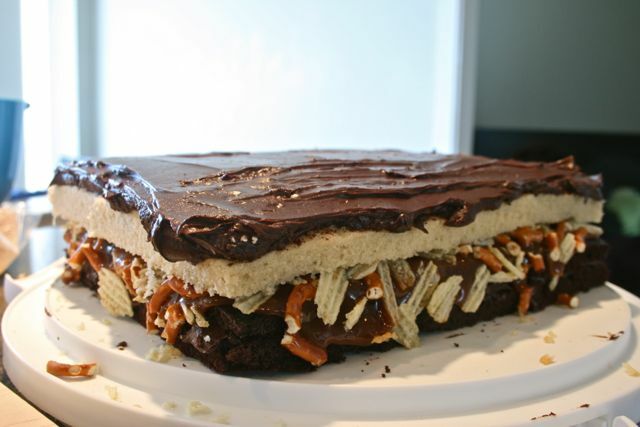 I sprinkled the crushed pretzels and potato chips on top, pressing them into the quickly cooling and stiffening caramel. Vanilla cake and then ganache. 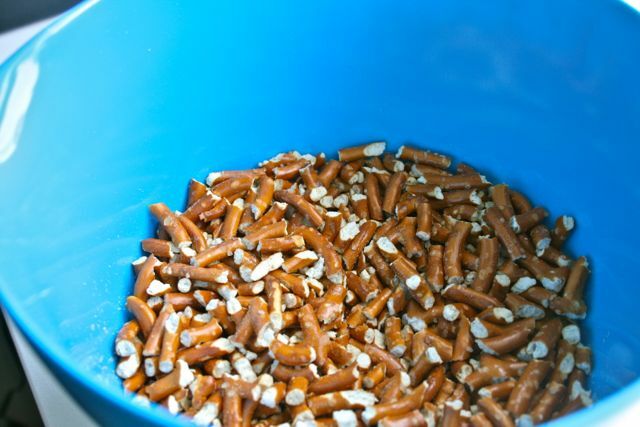 I smartened up and mixed the pretzels & chips into the caramel. Another layer of chocolate cake, smothered in vanilla buttercream and sprinkled with the remaining dark chocolate shavings. I used Sweetapolita’s fabulous whipped vanilla bean frosting (recipe here). It’s not too sweet so in my mind, absolutely perfect. I know, I know…pathetic frosting job. 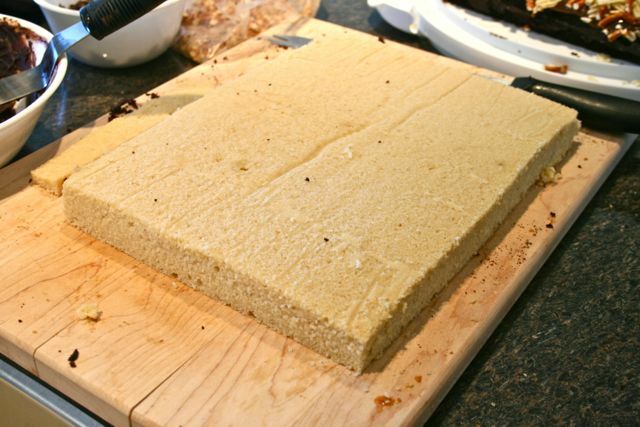 And my cake isn’t a perfect rectangle. 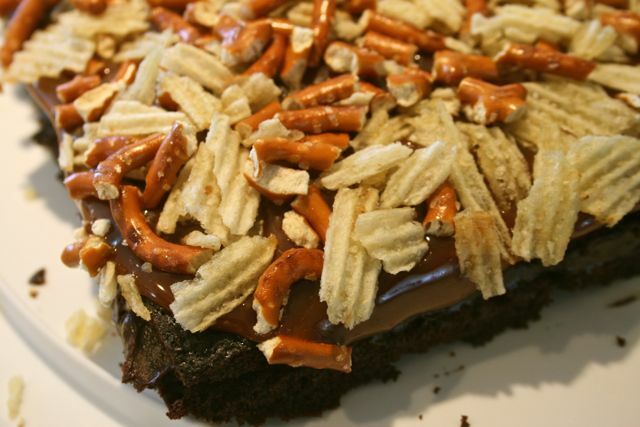 Let’s cover up the imperfections with crushed pretzels & potato chips and cake crumbs! It’s like the little black dress treatment for ugly cakes. When I was done, the cake was crazy heavy due to my forcing a thousand different elements into it. Go big or don’t bother showing up. Show time! Lordy lordy someone’s 40! I think the cake was a hit. It tasted fantastic, if I do say so myself. I had two gripes with it, however. The first was the fact that the layers didn’t stick together, so when pieces were cut, the layers would fall apart. Second, I wish I had planned the order of layering so that there was more contrast between the light and dark layers. It’s not the best aesthetically but it sure made up for it in the taste department. The cakes were moist, the ganache was rich, creamy and decadent, and the soft, subtle vanilla frosting rounded it all out. 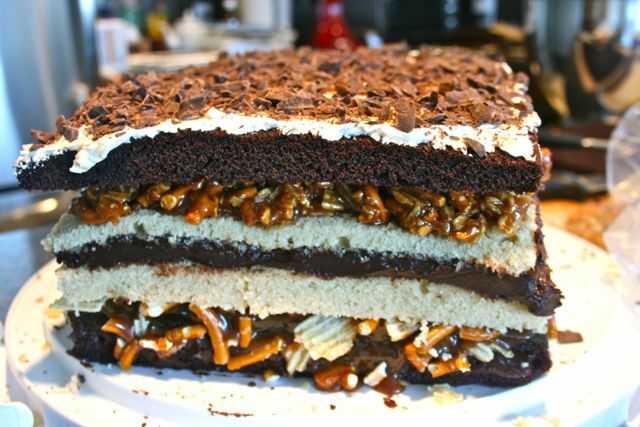 The best part of the cake though was definitely the caramel-pretzel-potato-chip layer. I could’ve eaten buckets of it. It tasted like chewy, salty toffee and each bite yielded a different, complex flavour combination. 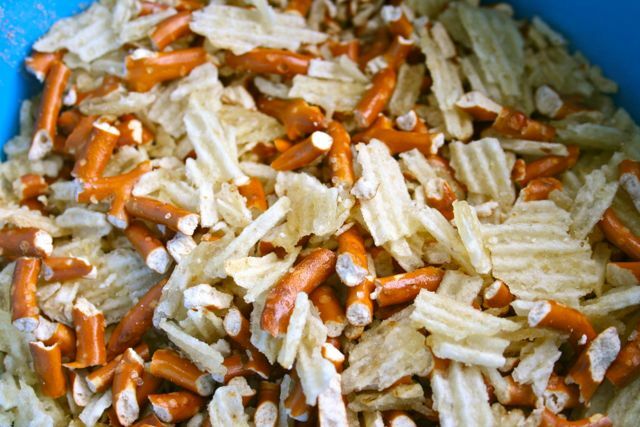 You’d taste caramel, then get a hit of salt, you’d bite down on a pretzel and then catch a taste of salty, oily, crispy potato chip. Heaven! Happy 40th birthday, Mr. Smith! 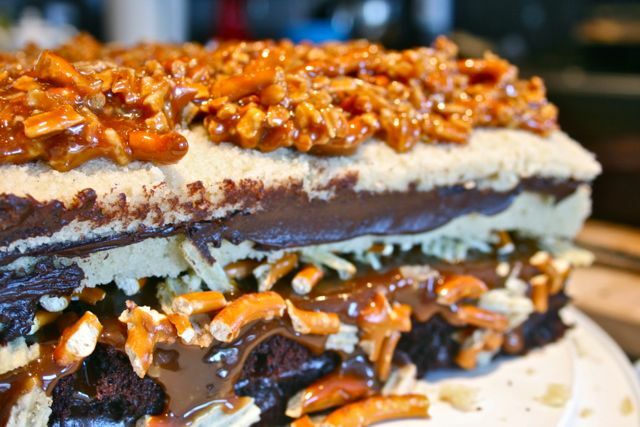 This cake is nuts! Crazy awesome. Thanks, Vince! I’m glad my instability comes in handy somewhere! This cake looks awesome! 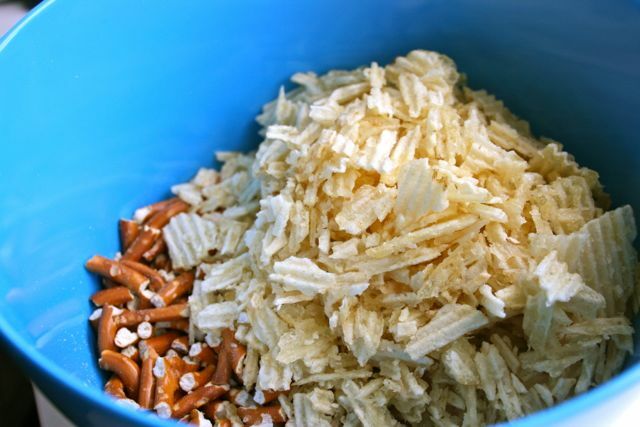 I love that you put in potato chips and pretzels. 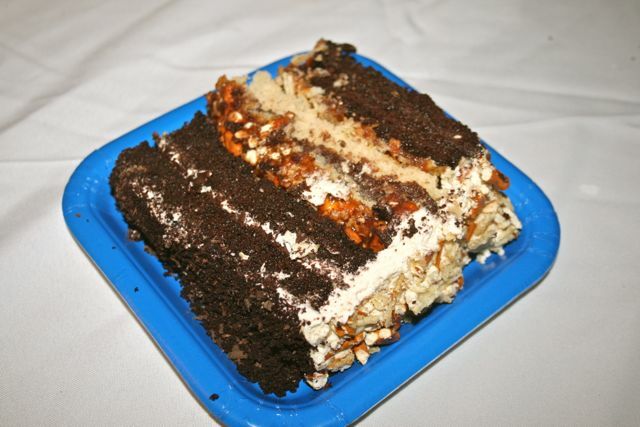 I’ve seen so many people make compost cookies with those, but haven’t ever thought of putting them in a cake. 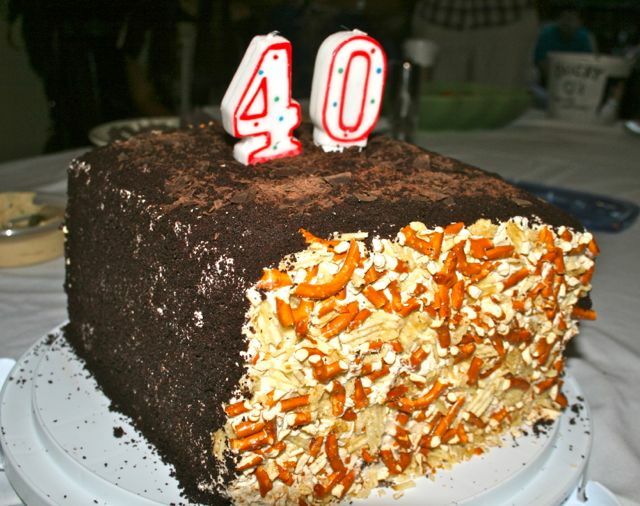 This cake is definitely fit for the big 4-0 milestone! Awesome job! “Go big or don’t bother showing up”- Love it! Speaking the truth my friend! Now, THIS is a cake. Wow! I love it! 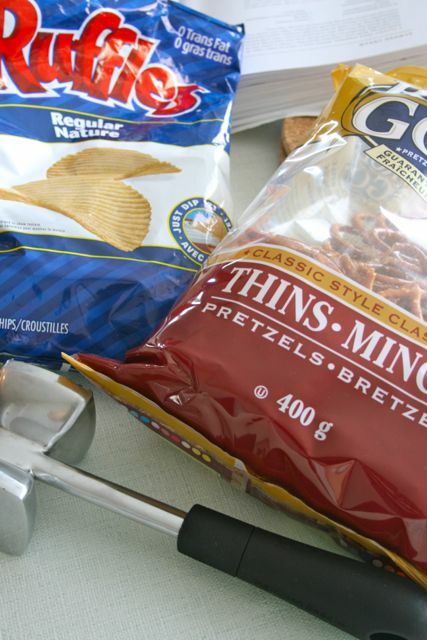 I also love that you put in ruffles and pretzels, wow! (again!). 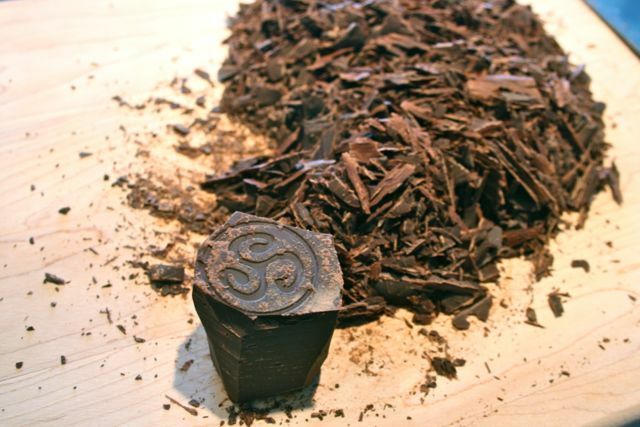 When you describe the cake in the last paragraph, it does sound like heaven, yum! How much did Mr. Smith love this cake?! Not to toot my own horn, but Mr. Smith was pretty happy! I haven’t had too much time to look into the postal restrictions on sending food across the border. I think it’s ok to mail packaged food and even home-baked goods but I want to call the post office to check. I think the reason the foodie pen pals don’t do cross-border hook-ups is because they’re worried packages won’t make it in the time deadlines. If you and I do it ourselves, we won’t have to worry about that. I’ll send you a private email when I have more info! Lol – I’d better figure out the customs/postal requirements for mailing cake across the border. Only the biggest and best for my #SS BFF! This looks positively phenomenal. 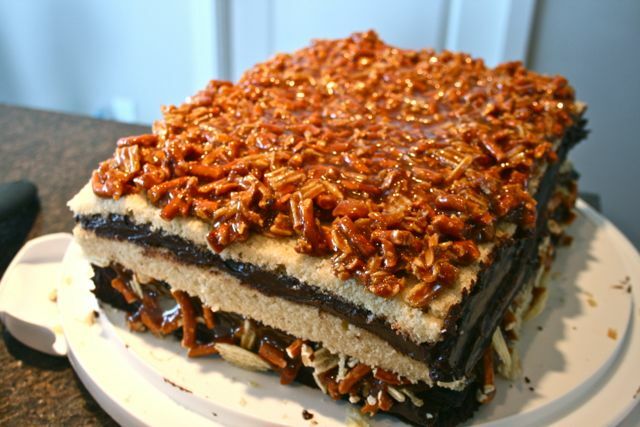 The salty sweet layer just sounds like…well, I want to be eating it for the next hour or so. Also: “The next morning, I woke up early and decided I didn’t have enough cake.” <– That is how I feel every morning. haha, thanks lady! Cake always makes every day better (unfortunately for my waistline). I would highly recommend making caramel and filling it with pretzels, potato chips, whatever you want, and spooning it from the bowl. That is pure insanity (in a good kind of way, of course)! Lol, thanks Niki! I think so too. 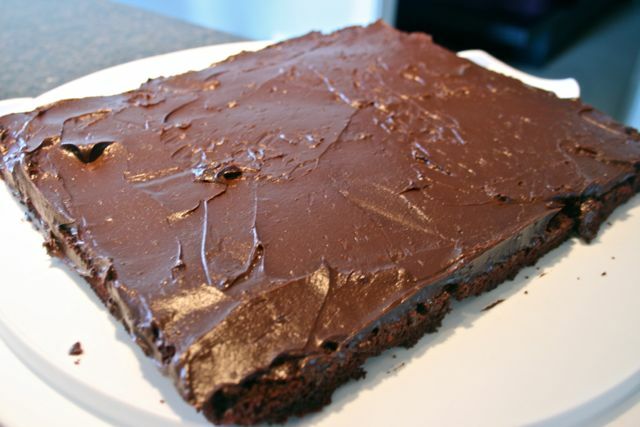 Gawd, I love drooling over your photos…..
Cake always makes me feel better on a bad day. Reading your post made me hungry for some cake! Cake makes me feel better all the time, throughout the day every day 😉 You should go and get yourself some right now! Oh my gosh, I’m in love with this. 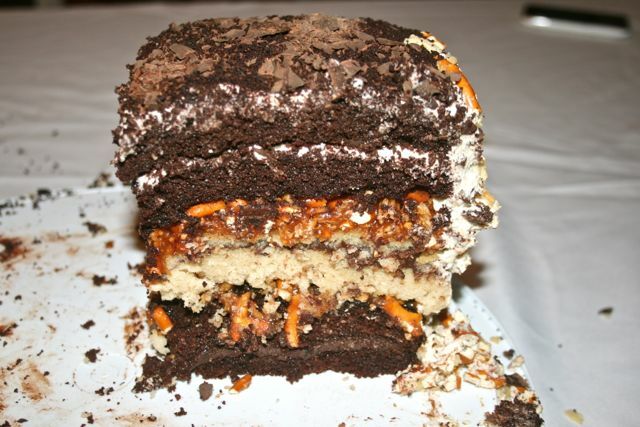 Crazy layered cakes are my absolute favorite.